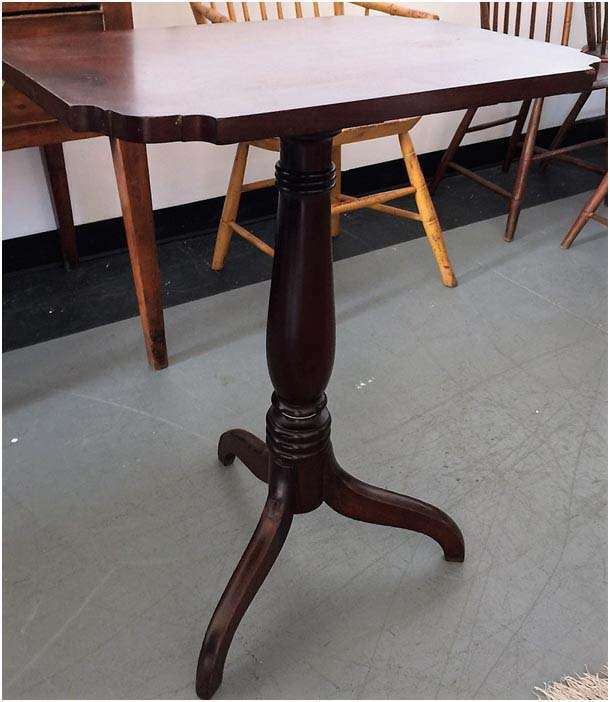 Most Southern collectors recognize this table quickly. For a number of years now, there have been quite a few that have surfaced in the trade. The usual story is that they from King and Queen County, Virginia, from about the 1840s. This Country Empire piece has a tilting top, suggesting that was probably intended for serving tea, though the hinged top also makes it useful for storing in a small place at the side of a room. From the Colonial era, the tripod foot has been especially practical for early houses having uneven floors. Having three feet meant having a stable balance on the floor. As better made houses were made in the Federal era, the advent of rectangular tables became more common. When Colonial Williamsburg decided to develop a Southern collection for the DeWitt-Wallace Museum, they too added one of these to their collection. It can be seen in their now classic reference book, Southern Furniture: 1680-1830, by Hurst and Prown, on pages 325 through 327. The CW collection piece is attributed to Southampton County, ca. 1830. There is also one in the Office in the Governor’s Mansion in Richmond, recently added to their collection. It had formerly been in the Mansion when Governor Pollard was in office, and it was attributed to King and Queen County.